It's a rainy day here in south Texas as we continue to deal with Tropical Storm Bill. While the coast has had it much tougher, I've just had waves of rain yesterday and again this morning. So thankful, as it could have been much worse. What else is happening on this Wednesday? Well, WOYWW, of course! Scratching your head and wondering what I mean? 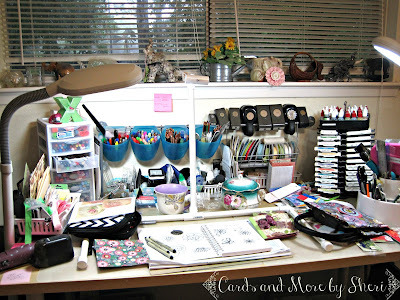 WOYWW stands for What's on Your Workdesk Wednesday and is hosted by the lovely Ms. Julia over at Stamping Ground. 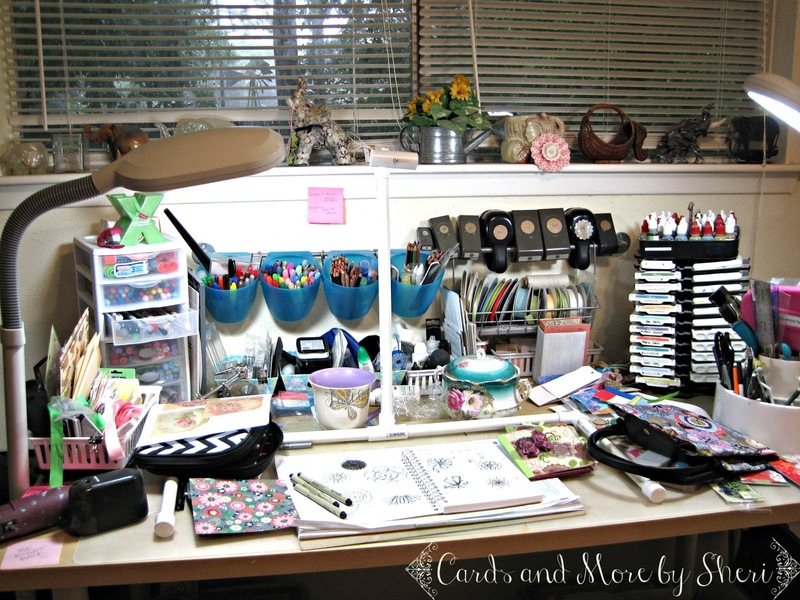 Lots of creative souls link up photos showing their work spaces. It's a ton of fun. Make sure you pop over there and check it out. Lately I have been fascinated with doodle art, flowers and hand lettering. Zentangling interests me also, but I think it might be a tad too tedious for me. I'm a big fan of Joanne Sharpe's work (check her out at Whimspirations). 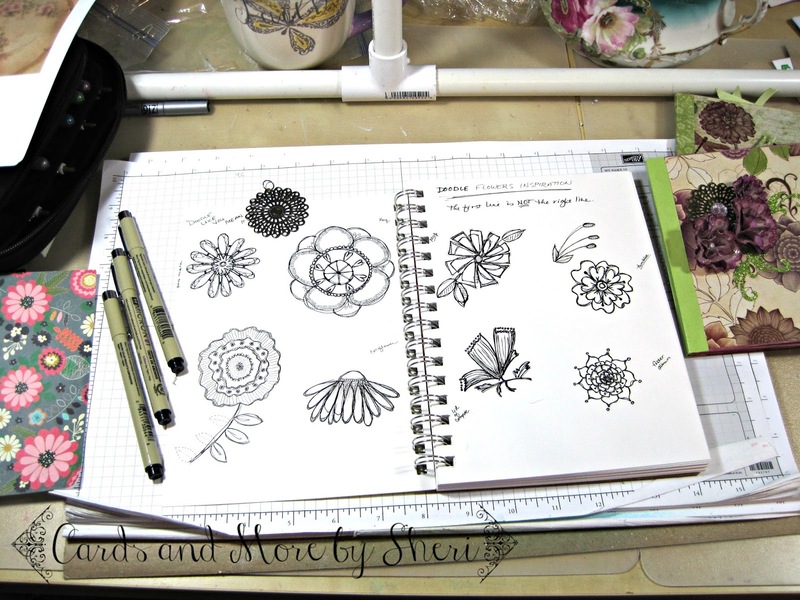 When I saw she was doing a new online class this summer called Bloomin' Doodles, I took the plunge and enrolled. Our first class was Monday, so what you see on my desk are some "inspiration" pieces and my first stab at doodling some of the motifs I found around my house. Here's a closeup of my attempts. Not too shabby, but definitely room for improvement. I'm looking forward to class number two today! You might also notice that my home made video camera stand is also on my desk (the pvc pipe contraption). That's because I was also filming a video yesterday. I was recently selected to serve in round two of the Design Team for the Kraaft Shaak. I'm super excited about this opportunity, and Monday my box of mixed media goodies arrived! As a design team member, we are given these items to use in our monthly projects. Amazing stuff! You can get these fun mixed media kits as well at the Kraaft Shaak store. Have a giggle and check out my video where I investigate my box contents. And stay tuned for my DT projects in July, August and September! Am loving the pipe 'contraption'. Great set up and works a treat huh! Intersetingly, my dear friend LLJ tried zen tangling because she so loves the idea..but was almost instantly bored, so I think your approach and the class is a fab idea.love that you've been round the house searching out medallions too...the things we don't notice! PVC pipe is good for things other than plumbing, as you proved. I'm not a fan of zentangles/doodles, but I like the medallions you found. I did the same when looking for cheap products to use with my Gelli plate. I am thrilled you are now on that design team. Way to go. Happy WOYWW from # 5. Forgot to mention that we've had floods here in KS, too. My back yard has standing water, which is slowly draining away. Now for the mosquitoes. Congrats on your round 2 design team selection. Love the doodles. I am a sucker for pretty flowers. 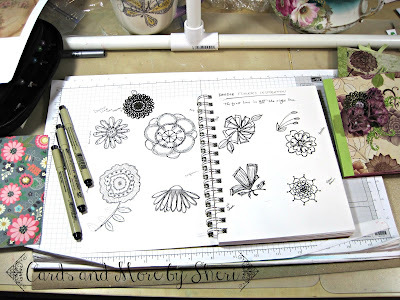 Congrats on being selected for the design team, I love your doodles, I am a big fan of flowers.